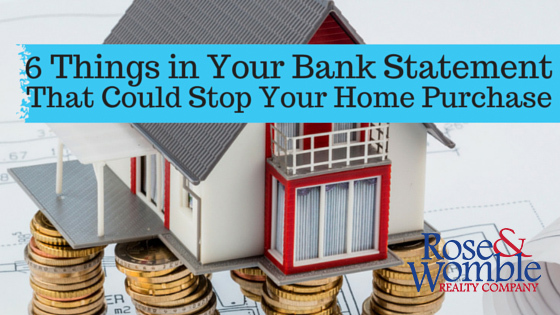 You might be surprised to find out that your bank statements reveal more about you to mortgage underwriters than you think. The bank statements, which are required during the loan application process, help give the loan officers a detailed financial snapshot of you. These show your spending habits, cash advances from credit cards being deposited, overdrafts, and delinquencies. The information in your bank statements can be used to request more documentation and justification from you to justify the bank giving you the home loan. These are just a few examples of some of the items that banks can use to determine creditworthiness. Every deposit in your bank account needs to be explained and documented. While paying for items in cash is good for your FICO® score, having piles of undocumented cash is a negative for a home loan. Every deposit and fund used for a home purchase must be explained and documented. If you receive a gift, especially for the down payment, closing costs, or for the purchase itself, the gift must have a paper trail from the donor to the borrower. If the potential homeowner sells major items, like a car, boat, or other piece of property, then there must be a bill of sale and a paper trail. When the buyer applies for a home loan, the bank will typically ask for two months of bank statements, so it is important to have all of these in order. Right before some buyers purchase a home, they may want to move money from account to account. This can actually delay the loan process because it creates more work for the loan processor. The loan processor has to track the transfer and withdrawals and match them back and forth. When there are more transfers than necessary, the borrower is creating more work and delays. For general financial health you should never have overdrafts. If you have any, you will need to be able to provide a very good explanation. If your FICO® score is 620 and you have no savings history, then you add overdrafts that could overturn an approval of the loan. The loan officer is going to need all pages of the bank statement, even if a page has no pertinent information. Any consistent payments going out like personal loans or child support will be questioned and may need to be counted in the debt-to-income ratios. These could affect qualifying. The bank will need proof that the check has cleared. Accepting cash for the earnest money deposit is tricky, while money orders and cashier’s checks are acceptable forms of payment for earnest money deposits the lender will need to know where the funds came from. Anyone writing a check for the earnest money deposit that is not named on the loan must provide a gift letter stating that the buyer does not have to repay the money. The best news is that with enough notice before closing, the loan officer can rectify or preempt potential problems. The best course of action for a potential home buyer is to consult with a loan officer before beginning a home search to become prequalified. What Do Mortgage Terms Mean?